Welcome to The Adventures of Raindrop website! Raindrop is the delightful creation of Nancy F.A. Woolnough whose “Adventures of Raindrop” have fascinated children in many lands for several decades. Raindrop lives with Mother Cloud in the blue Skyways. Friendly North Wind takes her on fascinating trips with companions such as Snowflake, Drizzle, Sgt Rainwater, and Tear Drop on adventures that teach them how to apply biblical truths. CDs & Cassettes HERE !! Secure payment made through PayPal using your Credit Card, eCheck, or Paypal Balance. 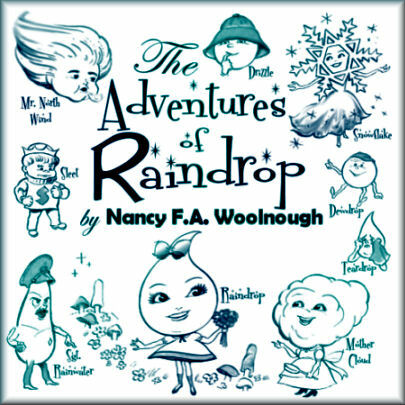 You may now make a donation to thank and support Raindrop's creator Nancy Woolnough. Click the link below to show your love and make a donation to Nancy.